From noisy neighbours to reckless taxi drivers, we cover the do’s and dont’s of going on holiday. DO run! If you only have hand luggage and have already checked in, there is still chance you can make the flight, as most airports close the gates as late as 15 minutes before departure. DO expect a rebooking fee, as most airlines will charge you to get on another flight. DON’T wait to call your airline, as the sooner you do, the more likely the will be able to get you on the next flight. DO use earplugs. You can pick them up in the airport or even while on the plane. DO claim your overhead and under-seat space. DON’T be rude, this will only escalate the problem. DO go the chemist. The local pharmacist should be able to provide a loperamide-based drug that will prevent dehydration and help you get better. If symptoms get worse, seek medical advice. DON’T think you’re holiday is ruined. Food poisoning can usually last two to four days, so there is a chance you still enjoy your holiday happily and healthily. DO get out if you feel unsafe. If your driver doesn’t respond to polite feedback, ask them to pull over. Make sure you record the car number so you can inform local authorities. DON’T refuse to pay. Tipping is up to you, but the receipt could be handy if you choose to report the driver to local authorities. DON’T think you can handle the situation yourself. It is safer, and easier, to contact hotel management. DO ask their permission. You wouldn’t like it if a stranger just took your photo, so be considerate and ask them first. DON’T try to be sneaky! Chances are they will see you taking it, so if someone says no, just find someone else to photograph. DO ask another waiter or waitress for their service. If you feel like you’re being ignored you can always call for the manager. DON’T be quick to judge. In some countries, waiters will wait for a signal from the diner before approaching the table. DO have a price in mind, but be fair! Ask locals what they’d spend and go from there. DON’T look desperate. If they think you will walk away without purchasing the item, it is likely they will offer you a better deal. DO tell the hotel staff. They are bound to find out, and if the damage is only small they are more likely to let you off the hook for being honest. DON’T assume you it won’t cost you. If the damage is significant, you could be asked to pay for repairs, so be careful! DO stand your ground! Additional fees should be clearly presented to guests, so if they were buried in the small print, address the situation with the front desk or a general manager. DON’T always think you’re in the right. If you’re hotel did inform you of fees, or extra costs, take responsibility for your actions and pay up. DO cancel all your cards immediately and report your stolen goods to the police. If your passport is stolen, get in touch with the nearest Western Union and they should be able to send a replacement within 24 hours. DON’T forget to take out travel insurance! It’s always better to be safe than sorry, so prepare for the worst and make sure you take out insurance. If you’re traveling abroad this year, make sure you are fully covered! Think Insurance are travel insurance experts and can tailor a plan to suit your needs. This entry was posted in Travel Insurance on April 14, 2014 by admin. Holidays are all about fun and relaxing, so don’t spend the run up to yours stressing about what to pack, how to pack it, and how much you’re actually allowed to pack. You don’t have to physically start packing early, but you need to start thinking about it. By planning early, you can give yourself enough time to pop the shops for anything you may need or have forgotten . Before you start picking out and matching outfits, make sure you know how much you’re allowed in your hand baggage (a small bag that you can carry on to the plane) and your hold baggage (your suitcase). Try using baggage that doesn’t weigh too much, this way you can fully utilize your baggage allowance. Weigh your bag the night before you travel so you have time to adjust the contents or order extra baggage online. Think about the activities you will be doing while away, and if you can, check the forecast for the time period that your staying. Bring the clothes you will NEED, before you start picking out the clothes you want. Make sure you include toiletries, gadgets and accessories, medicines, books and guides. The majority of people will travel with far too many clothes, shoes, bits and bobs. Layout everything before packing it and think “Do I really need this?”. You can usually buy every day items at your destination, wash clothes or use laundry services while you are away, so keep that in mind when packing. Now for the tedious part, fitting it all in. The best way to pack clothes is by rolling them up, as apposed to folding them. This helps prevent creases and also allows a lot more to fit in. Here are a few other helpful tricks and ideas to packing! 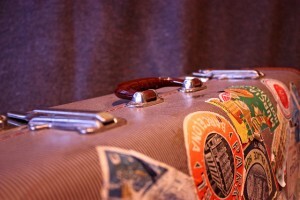 – If you’re packing gadgets in your case, wrap them in clothing or other items to help protect them during the journey. – Pack toiletries together tightly into a plastic bag to prevent them leaking. You can now buy small, empty plastic bottles that you can transfer your liquids in to save you carry a large bottle. Remember, liquids going in your suitcase are fine, but if you want to carry them in hand luggage they must be a certain size and be carried in a separate, small, clear plastic bag. – Save some of your baggage allowance by wearing your heaviest, and bulkiest items threw check in. It tends to get chilly on the plane anyway, so it’s likely you’ll be grateful you wore them! – Prepare for the worst and pack a change of clothes, essential medicines and basic toiletries in your hand luggage just in case your hold baggage gets lost along the way. Remember to also place travel documents into your hand luggage for easy access! When going on holiday, travel insurance is probably the last thing you want to think about, but it’s important to make sure that its one of your top priorities, or it could end up costing you more than your bargained for. Think Insurance are travel insurance experts and can create a plan to suit your needs. Get in touch today to see how much you could save on your travel insurance. This entry was posted in Travel Insurance on April 8, 2014 by admin. This weekend has been dubbed ‘Sunshine Saturday’ due to the amount of people visiting travel agents in hope of escaping the winter blues, with travel companies predicting around one million people will visit stores and websites this Saturday. With the adding factor of the recent stormy weather and widespread flooding, this Saturday is said to be the most busiest holiday shopping day of the year. Travel firms have also slashed prices of many designations, make it easier to escape the cold English weather, with Greece, Croatia and the Balearics tipped to be most popular short haul destinations. Jeremy Ellis, head of marketing, said: ‘With Christmas firmly out of the way many people want a holiday in the sunshine to look forward to. ‘Over the last few years we’ve seen a trend towards booking holidays earlier and with record bookings over Christmas we’re expecting the rush to continue with our busiest day of year this Saturday. Mark Tanzer ABTA Chief Executive said: ‘We know that Brits hate to cut back on their holidays and after several years of tough market conditions, we are seeing early signs of more optimism amongst British consumers. ‘However, with the squeeze on household budgets continuing, we are expecting that tried and tested destinations and package holidays will continue to perform well in the coming year. Thinking about going without? Click here to see how much NOT taking out travel insurance could cost you. This entry was posted in Travel Insurance on January 8, 2014 by admin. An Australian man was holidaying in Cornwall when he fell down a sheer 60ft drop on a cliff in Cornwall. The 80-year-old slipped off a cliff path in Mount Edgcumbe Country Park and was saved when his clothes caught on brambles. Coastguard teams and MoD Police were called to the scene and helped lower him down the drop until he was safely on the ground, where he was then put on a stretcher and transported across Plymouth Sound on an MoD boat to ambulance. The holidaymaker escaped with cuts, abrasions and a bruised back. If you’re going on holiday make sure you’re insured. Get in touch with Think Insurance now for a Travel Insurance quote. This entry was posted in Travel Insurance on September 12, 2013 by admin. If you’re going on holiday abroad and need travel insurance, get in touch now for a quote! This entry was posted in Travel Insurance on August 15, 2013 by admin.